Packed with seaside fun and beach-related attractions, Brighton is certainly highly suitable for children and all of the family. 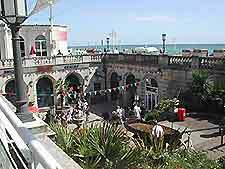 Always popular is the Brighton Sealife Centre, in the Kemp Town area, which is actually one of the world's oldest aquarium centres. On Brighton Pier, the video games and slot machines are on hand, being the perfect draw card for a rainy day. When the sun is shining, consider spending some time learning to windsurf at the Hove Lagoon, or maybe take a ride on the Hove Park Miniature Railway, where small steam trains show off their strength by pulling carriages of passengers around the park. Attractions at the Sealife Centre include the Ocean Tunnel, which is amongst the longest observation tunnels in the country - providing uninterrupted views of sharks and enormous sea turtles, cliff displays, a touchpool where children are able to touch some of the exhibits, a ray pool, a large collection of sea horses, an education resource centre, a café, a cinema, a gift shop and a soft-play area for young children. The Sealife Centre also features regular feeding displays and many important breeding programmes, helping to protect some of the ocean's endangered species. A number of the exhibits have recently been refurbished and renovated, including a novelty glass-bottom boat. 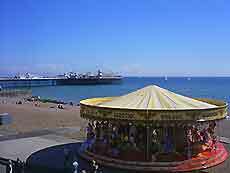 Located on the pier, the Palace of Fun and Pleasuredome is full of appealing attractions for children of all ages enjoying a seaside holiday. Featuring the latest state-of-the-art arcade games, simulators, adventures and traditional amusements, the Palace of Fun is certainly one for all of the family. If you are feeling hungry after playing on the video games, then you may well like to enjoy some fish and chips on the adjacent beach. 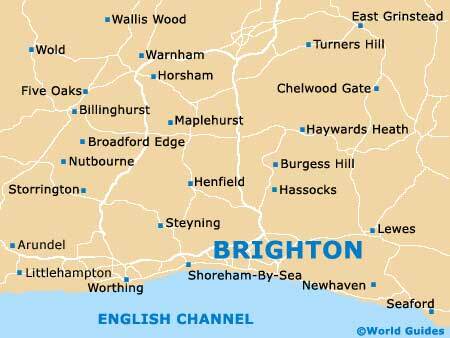 The Hove Lagoon resides within the North Laine region of Brighton, where it is a significant tourist magnet. With a popular centre for water sports, there are excellent facilities for sailing, windsurfing, boat rides, speedboats, cable wakeboarding, waterskiing and most other outdoor activities. Hove Lagoon is also home to a boating lake with rowing boats, a playground area for children, a paddling pool and a café. Next door, you may also be interested in checking out the Hove Deep Sea Anglers Club, or taking a lengthy stroll along the beachfront. Operated and maintained by the Brighton and Hove Society of Miniature Locomotive Engineers, the Hove Park Miniature Railway is situated on one side of Hove Park, where it stands close to the Greyhound Stadium and dates back roughly 50 years. This seasonal scale steam railway is one of the most popular attractions for children in this area, when it is running. The staff are all enthusiastic volunteers and are always happy to answer your questions.